We are pleased to present this information on bamboo office chairmats, as shown and described by the manufacturer. Because we have not checked into this product, we are unable to endorse it or provide you with any additional information. Anji Mountain Bamboo Rug Co. has introduced a 48"x72" Bamboo Chairmat to address demands for a mat for larger workspaces. Other new styles are smaller versions of the 55"x57" Original Bamboo Rollup Office Chairmat to meet the needs of customers whose workspace is suited to a traditional mat but lack the space. Available in two finishes, the Bamboo Rollup Office Chairmat rolls up like a rug and has 2-inch wide 1/4-inch-thick slats, multiple layers of premium UV coating to resist scuffing, rounded edges, and non-slip felt backing to protect the floor and keep the mat in place. They are stylish and durable and offer an attractive and green alternative to utilitarian vinyl mats. Manufactured in the Anji Mountains of China, these bamboo chairmats are made from Anji Mountain bamboo, widely considered the strongest and most durable species of bamboo in the world. 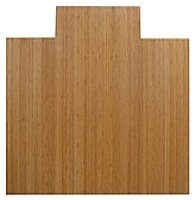 Anji Mountain Bamboo Chairmats and Bamboo Rugs can be found nationwide at retailers. For more information about Anji Mountain Bamboo Rug Co. and their products, please visit www.anjimountainbamboorugco.com (01/03/08). Anji Mountain Bamboo Chairmat & Rug Co. 36" by 48"